1) Writing conventionally with Kanji and Hiragana, the latter of which functions as inflexion suffixes and prefixes, a.k.a. okurigana. 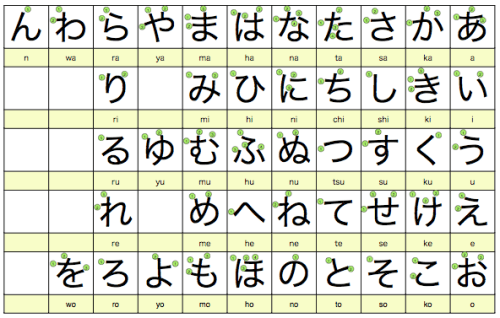 2) Writing solely in Hiragana and Katakana, i.e. syllabically, which is used for children to understand and also in advertisements. 3) Writing in Romaji, which is extremely rare, but does come about every now and again. So let’s talk about Romaji, because we here use it a lot. Romaji is the transcription of Hiragana and Katakana to Latin script. Latin script is essentially the alphabet we all know and that we all use in the western European languages. So what is happening is that we are taking symbols that designate syllables and transforming them into letters that designate individual sounds. That can be a bit tricky. Three styles exist for Romaji: Nihon-shiki, Kunrei-shiki, and Hepburn, named after the missionary James Curtis Hepburn. Nihon-shiki and Kunrei-shiki were made for Japanese speakers. Hepburn was made for foreigners, who used the Latin alphabet as a main script, to be able to pronounce Japanese without much of a hassle. Some will say that Kunrei-shiki and Nihon-shiki don’t agree on how to render を, but that’s one of the more inconsistent renderings. Sometimes it’s O and sometimes it’s Wo. In Hepburn, it’s O. This is how each Hiragana character and (its Katakana equivalent) is meant to be romanized. So the three systems agree with everything in bold as well. Nihon-shiki is the older from of Kunrei-shiki. The way Japanese is pronounced has changed a lot recently; and Kunrei-shiki allows these things to be seen. ぢ and づ in Nihon-shiki are Di and Du. Since those sounds do not exist in modern Japanese, Kunrei-shiki writes them as Zi and Zu. BUT, although it is written as Zi, Japanese does not have a syllable that sounds like [zi] (as in the word zeal), instead, Kunrei-shiki wants it to be known that it sounds just like the character じ, which they also render as Zi. (I know this is a bit confusing. I’ll have links to the Wikipedia articles where you can see full charts. I’m just providing the logic behind it.) Hepburn rendersぢ as Ji, as it does with じ. Long vowels work a bit differently in each as well. For NIhon-shiki, they are marked with a circumflex: しょう is written Syô. For Kunrei-shiki, they are marked with a macron: しょう is written Syō. For Hepburn, they are marked with a macron or by writing the vowel separately: しょう can be written as Shō or Shou. BUT, for all three, if the う is a suffix and not part of the morpheme itself, then it is not considered a long vowel even if it pretty much sounds like it. What we use here is a modified version of Hepburn. Why? Because Hepburn is easier to read. Nihon-shiki and Kunre-shiki make the assumption that the reader will know the patterns and allophones necessary to pronounce the Romanized Japanese correctly. If a foreigner were to see “Di” on a piece of paper or “Sya”, he or she would never think to pronounce that “Di” as a [dzi] (as in “Jeans”) or as [tʃa] (as in shower). Our goal is to make sure everything sounds like what one would hear. That being said, I refrain from writing macrons or circumflexes because I want everything to be clear because I put the hiragana above the Romaji. Also, we will be discussing Morae eventually– I’ve already brought it up tons of times– and knowing that there are separate characters (and thus separate Morae because, once again, Hiragana represents Morae more than it does represent syllables) will be important. So there’s a short and easy lesson for you all.